We strongly recommend that every learner should purchase both the printed coursebook and the interactive one to study effectively and to enjoy all the benefits our company offers. The Interactive coursebook for learning English based on the principles of the direct method, published by Direct Language Lab. Learn the correct pronunciation thanks to the recordings of all words, explanations as well as questions and answers! Study in an active and effective manner by viewing and hiding vocabulary translations as well as answers! You can listen to all the words, explanations as well as answers and questions recorded by native speakers in order to find out how to pronounce words and sentences as well as to learn the correct pronunciation! You can view and hide the vocabulary translations as well as answers to the questions in order to study in an active and effective manner! New words are translated into 10 languages, so you always understand the new work! 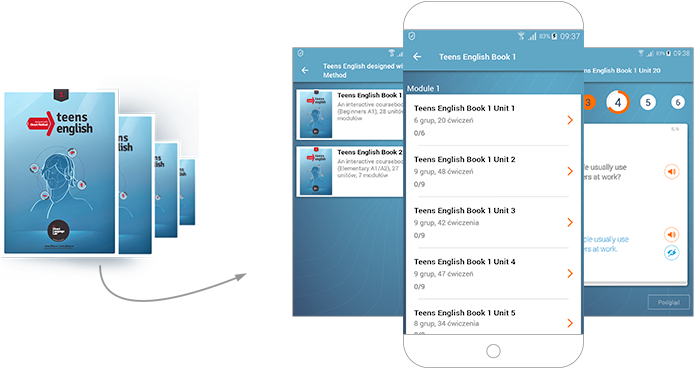 Our app contains a useful dictionary in which you can find words in your book and jump immediately to the right place in order to practice them! The app knows what you have already done and where you finished studying last time so you do not waste time looking for material! Start learning in a modern, active and effective way, whenever and wherever you want to! The interactive coursebooks contain all the material from the Direct Language Lab coursebooks (Wydawnictwo DEEP sp. z o.o. sp. k.), apart from the communication and grammar lessons. The interactive coursebook can be purchased from Google Play and iTunes.